The Petmate 2-Door Kennel is ideal for small pet transport as well as housetraining puppies and toy breeds. Featuring an attractive, contemporary design and sturdy steel wire and plastic construction, the 2-Door Kennel is as attractive as it is versatile. 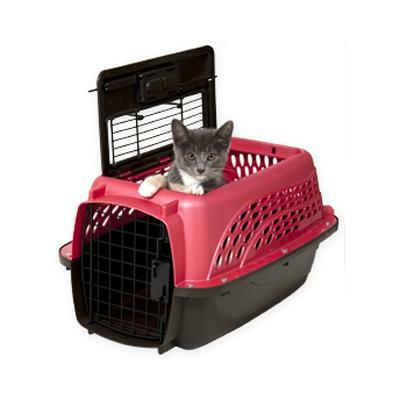 Standard door on front of carrier is complemented by the larger roof-door, making it easier to transport difficult and anxious pets and is especially useful for cats. Carrier measures 19.4 x 12.8 x 10-inches. Suitable for pets up to 10-Lbs. Color may vary.